In January 2018 we made 5 predictions for the cannabis sector and we will review how they stacked up against the reality. We are making 3 new predictions for 2019: oversupply in Canada, the U.S. will outperform Canada, divergent performances among pot stocks. 2018 was a dramatic year for the cannabis sector as it went through two full cycles of boom and bust; we remain hopeful for a strong 2019. Welcome to The Best of Cannabis series where we discuss some of the most important trends and topics that every cannabis investor must know. Since we made our 5 predictions for the cannabis industry in January 2018, things have changed a lot and we thought it would be helpful to review the predictions we made for 2018 and present our outlook for 2019. Marijuana production will become commoditized. 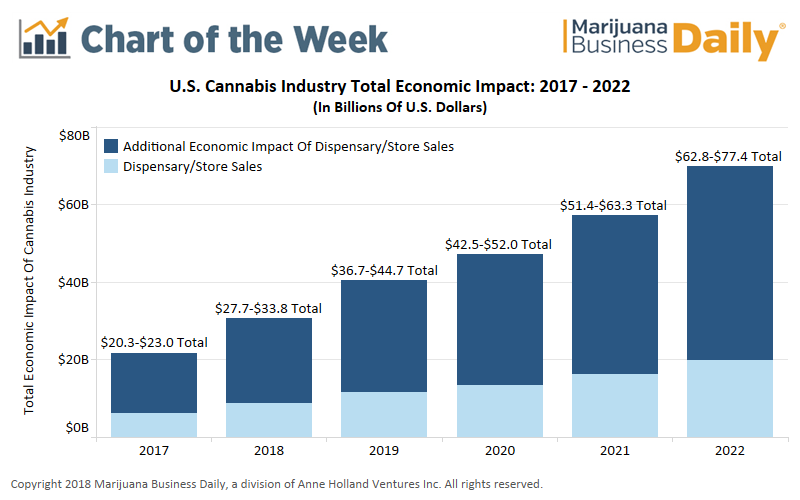 (Reality: we did not quite get there yet in 2018 but we are seeing a trend among the cannabis producers to move in this direction. Greenhouse operators such as Village Farms (VFF) are starting to emerge as the low-cost specialized cultivator. On the other hand, more and more cannabis firms have decided to outsource their production and focus on branding and other areas such as Cronos (CRON) and Emblem (OTCQX:EMMBF). Below we will present our top 3 predictions for the coming year and discuss our reasoning. We believe 2019 is going to be another exciting year for the nascent cannabis industry and catalysts remain abundant. Based on our long-time predictions that the Canadian cannabis sector will face significant oversupplies by 2019 and 2020. We have analyzed the popular industry estimates and concluded that the expected supply will outgrow the demand by a wide margin once Licensed Producers ("LP") complete their constructions. We have seen many newcomers into the market with ambitious plans to convert existing greenhouses and build brand new dedicated growing facilities. It is not that expensive to convert or build a cannabis facility, and the unlimited licenses issued by Health Canada will result in a situation where cannabis prices will fall dramatically once the supplies currently under construction enter the market. We expect this to happen towards the 2H of 2019 and 2020. 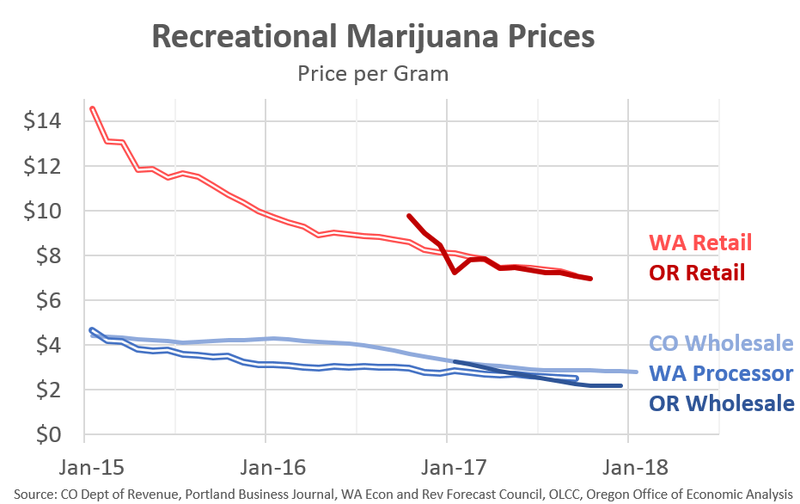 Many U.S. states have experienced a similar dramatic fall in cannabis prices after legalization and we should expect the same to happen in Canada. 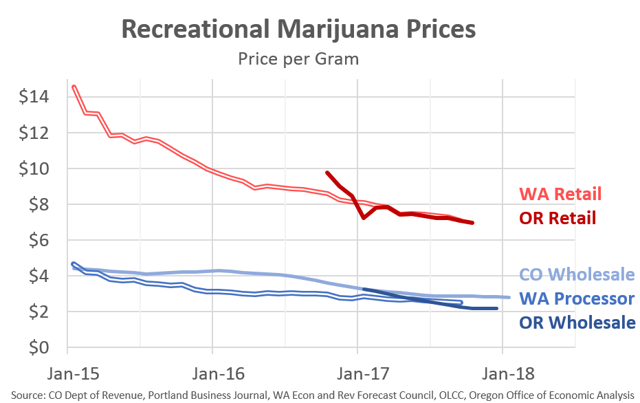 See the chart below for what happened to pot prices in Oregon, Washington, and Colorado after legalization. As Canadian LPs complete their capacity buildouts, which we estimate to be at least 2.5 million kg per year, there is a very high likelihood that the Canadian marker will become severely oversupplied. Most of the current research puts Canada's recreational demand between 0.5 to 1.0 million kg per year. Additionally, our supply estimate only included the announced capacities from the top 20 LPs, which means that a large chunk of the capacity is not accounted for and are being built by smaller producers across the country. Health Canada has issued 168 licenses at the time of this writing so it is plausible to imagine a much more robust supply picture. We think the U.S. cannabis market will outperform the Canadian peers in the coming year mainly due to the different regulations and business environment in the two countries. The U.S. companies enjoy the ability to operate vertically integrated operations that provided strong margin retention compared to Canadian retailers that have to procure from the government-run wholesalers. The regulations in Canada also include significant restrictions on cannabis retailers (37 per entity in Alberta, 8 in British Columbia, and 15% cap in Ontario) and Ontario had essentially banned licensed producers from operating retail stores in the province directly. The provincial governments in Canada will procure cannabis from LPs and will then act as the wholesaler for retailers after charging a layer of margins in addition to federal and provincial excise taxes. We also think the U.S. has a much more robust growth outlook as more and more states are moving towards legalization. During the latter part of 2018, three additional states legalized cannabis (Michigan, Missouri, and Utah) and the U.S. also legalized hemp cultivation federally, paving the way for CBD to be utilized in many product forms. Many states are also expanding their existing medical cannabis programs and companies are still in the early days of penetrating those states that have just legalized cannabis in recent years. Overall, we just think the U.S. market has a much better growth outlook compared to the Canadian market and we tend to believe that the U.S. cannabis stocks as a group will deliver far superior returns and relative outperformance compared to the Canadian peers. In 2018 we have seen the cannabis stocks moving in tandem which is very similar to the market in 2017. However, we believe 2019 will be the year when cannabis stocks start to show divergent performances. The reason the cannabis stocks largely moved together in 2018 was that the Canadian market remains undeveloped and companies are only starting to report earnings from the post-legalization period now. Now that Canadian companies have reported their 2018 Q4 results, investors would be able to assess valuation and performances on a more informed basis. Overall, we think the early results were disappointing as supply shortages continue to hamper sales and profitability for Canadian companies in the near-term. Companies like Canopy (CGC), Aurora (ACB), Aphria (APHA), HEXO (HEXO), and OrganiGram (OTCGB:OGRMF) all reported strong sales from the recreational market. However, other firms such as CannTrust (CTST), Cronos (CRON), and Tilray (TLRY) have shown disappointing progress from legalization as sales came in way below expectations last quarter. On the U.S. side, we are expecting to see continuous new listings as private operators attempt to raise capital in Canada. The fragmented nature of the U.S. market created a large number of multistate operators that are expanding aggressively in states where cannabis is legal. M&A will become a key theme for companies looking to dominate the industry as players look to combine for scale and efficiencies. Cresco Labs (OTCQX:CRLBF) just acquired Origin House (OTCXQ:ORHOF) in a no-premium deal which showed that companies are willing to accept such offers in order to survive and thrive in the long-term. For most investors, 2018 was a dramatic year to be remembered. The cannabis sector went through two full cycles of boom and bust and investors were left with a bad taste in their mouth after the year ended with a prolonged selloff that sent most pot stocks into negative territory for the year. We remain confident that 2019 will turn out to be another great year for the industry as a whole as the Canadian market stabilizes post-legalization and the U.S. continues to push ahead towards full legalization on the federal level.